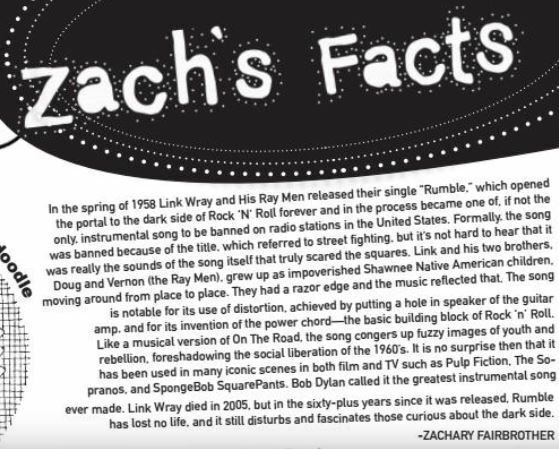 In the spring of 1958 Link Wray and His Ray Men released their single “Rumble,” which opened the portal to the dark side of Rock ‘N’ Roll forever and in the process became one of, if not the only, instrumental song to be banned on radio stations in the United States. Formally, the song was banned because of the title, which referred to street fighting, but it’s not hard to hear that it was really the sounds of the song itself that truly scared the squares. Link and his two brothers, Doug and Vernon (the Ray Men), grew up as impoverished Shawnee Native American children, moving around from place to place. They had a razor edge and the music reflected that. The song is notable for its use of distortion, achieved by putting a hole in speaker of the guitar amp, and for its invention of the power chord—the basic building block of Rock ‘n’ Roll. Like a musical version of On The Road, the song congers up fuzzy images of youth and rebellion, foreshadowing the social liberation of the 1960’s. It is no surprise then that it has been used in many iconic scenes in both film and TV such as Pulp Fiction, The Sopranos, and SpongeBob SquarePants. Bob Dylan called it the greatest instrumental song ever made. Link Wray died in 2005, but in the sixty-plus years since it was released, Rumble has lost no life, and it still disturbs and fascinates those curious about the dark side.